Andrew Zimmern & Bizarre Foods In May of this year, I had the opportunity to be part of the filming of Andrew Zimmern’s episode on Cypriot food. The show is called Bizarre Foods, but it’s not as “bizarre” as it sounds, in this case, it was more a feature about classic Cypriot food, since – I guess – not that many people in the US know about Cypriot food. I am ecstatic that there is a major TV show showcasing Cypriot food – I always say this, but I really think Cypriot food is unique and deserves its own platform – even if it is small. I acted as Andrew’s guide around some of the mountain villages, we saw how a family made halloumi, ate a huge traditional meal, saw how they made pastelli and also how hiromeri was made. I have to say, this is the most fun I had in ages. Andrew and Bizarre Foods crew were tons of fun and also so talented at what they do, but extremely humble at the same time. The show will be airing in the US on the travel channel on August 9th. I haven’t seen it, and I don’t know how I will come across since I have never been on TV before and am petrified I will look silly, but I have to say I loved every second of this experience! Anyway enough from me, enjoy this recipe and hope your summers are all going well. Happy Cyprus Cooking! 1. Boil a pot of salted water. Add spaghetti and begin to cook the same. 2. Season the prawns. Sprinkle salt and pepper and lemon juice on top. 3. In a large saucepan, add the 3 tablespoons olive oil and put on high heat. Add the prawns. Cook for about 30 seconds, turning them over, remove and set to the side. 4. 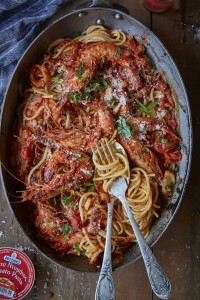 Add the onion, garlic, anise seeds, chili flakes, fresh fennel, prawns, grated tomato, tomato paste, passata, and chopped tomatoes. Cook until it reduces. 4. Add the prawns and the Ouzo and cook until the alcohol has evaporated (about 3 minutes). 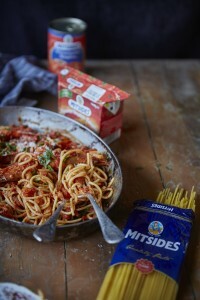 (If making a fasting version, simply omit the Ouzo). 5. By this stage, the pasta should be al dente. 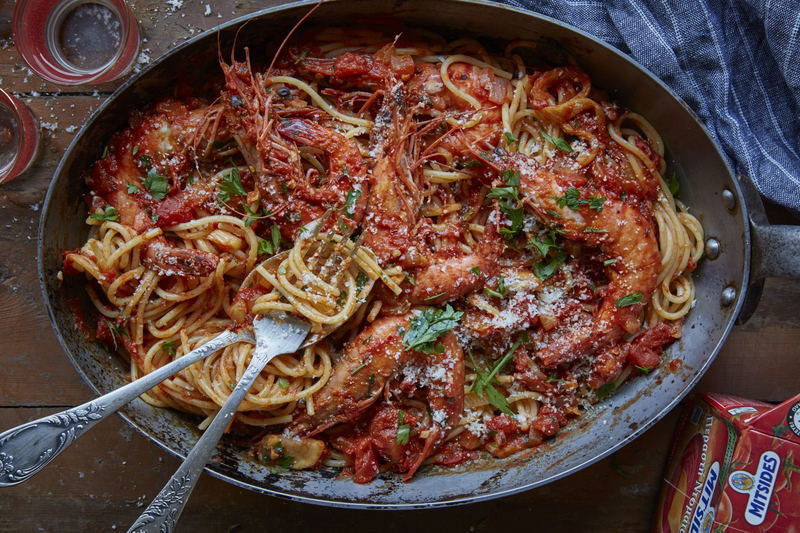 Strain the pasta and add it to the saucepan to soak up all of the prawn and ouzo-tomato sauce flavours. Serve with grated anari on top!